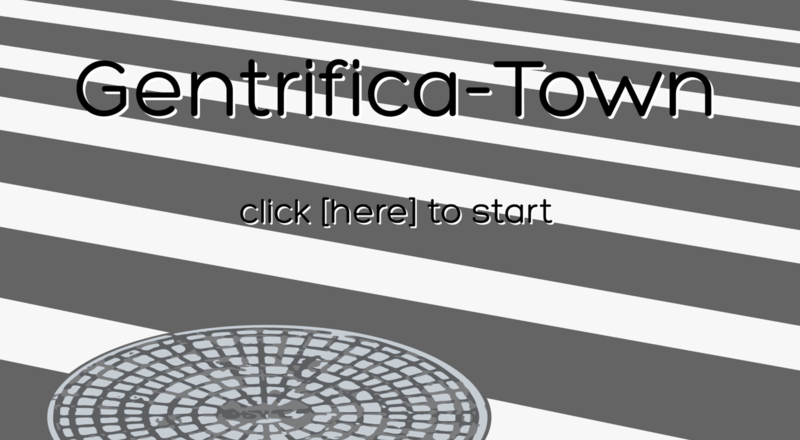 Start screen for the Gentrifica-Town game. How is your game story radical? My game puts the player into the shoes of a recent college graduate, who got a job in the city, who’s looking for an apartment in a gentrifying neighborhood in Brooklyn. As the player progresses through the game, they will be working towards getting an apartment. As the game progresses, the player will get the opportunity to rent their apartment but they may choose not to as it will be bad for the community. The goal is actually more complicated than they had initially understood. They have to rent an apartment without contributing to the gentrification of the neighborhood. What’s best for the player might not be best for the neighborhood. The main point in the street level where the player comes face to face with the game story is speaking with the landlord out in front of his apartment. The player goal is to find an apartment, and this is their first interaction with the landlord who they may eventually decide to rent an apartment from. He’s dismissive of the player’s character because of their age. Although he tends to assume (from judgmental snap judgment) that the player comes from an affluent enough background that they’re probably receiving some financial support from their parents. 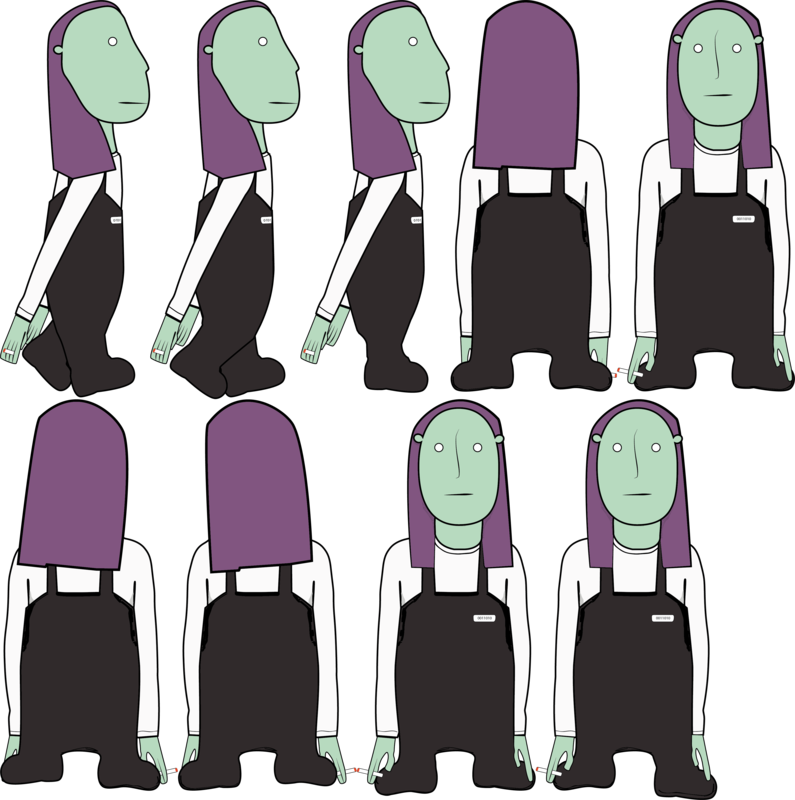 While the player reveals that it’s not true, that characterization of the player will frame the landlord’s interactions with them as the game narrative continues. 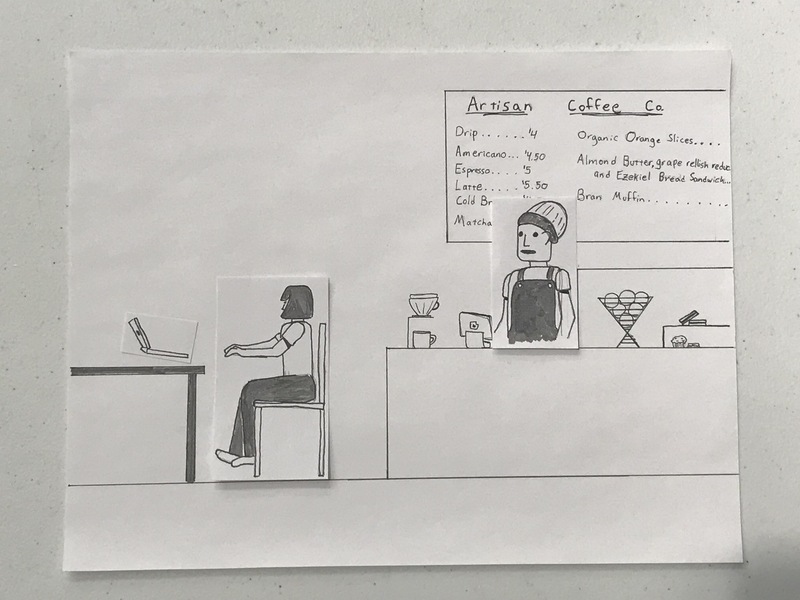 In the secondary level – in the coffee shop – the player asks around for advice about living in the neighborhood. They speak with the vlogger working on her laptop and ask her about the neighborhood and what it’s like living there. She cuts him off and ignores the question. She doesn’t answer the question, but this interaction is meant to illustrate that the type of community represented by the boutique-y coffee shop. 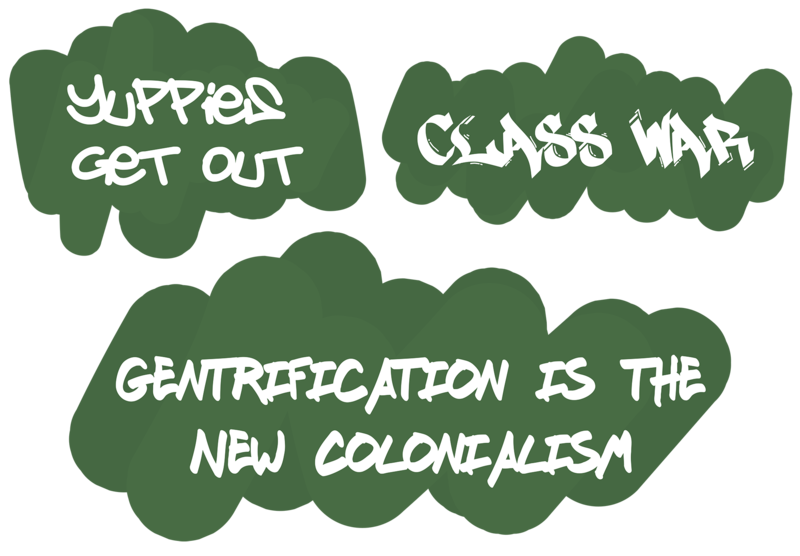 It represents a possible future for the neighborhood in which gentrification runs un-checked and there is no strong sense of community to protect the neighborhood and its inhabitants. While things may look nice and clean and minimal, everything is overpriced and clean to the point of sterility. If the player isn’t careful, their actions could cause that future to become a reality – they may get an apartment now, but it would destroy the neighborhood and the community. Eventually, the player would be priced out just like the people who are currently living there. Tagger, writing radical messages on the temporary construction walls. On the main level, the player passes by a kid spray-painting a temporary construction wall. 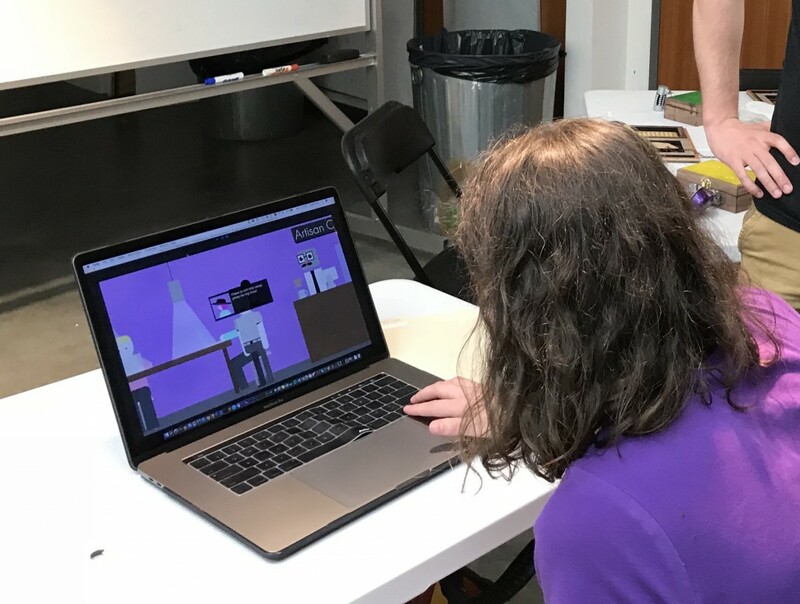 As the player passes, they will trigger an animation for the kid to spray paint the wall with new graffiti. His graffiti will subtly deliver the message to the player that the neighborhood is in the process of changing – not necessarily for the better – and as the player continues, they’ll see that their actions directly contribute to that change. Additionally, as the neighborhood becomes more gentrified, the graffiti will shift from being tags (from this kid) to street art advertisements, commissioned by companies, in an attempt to get consumers to photograph and share it on social media. So far, I’ve tried to surprise the player with the dialogue. Certain interactions, such as the one with the MTA worker, where he tells the player they can’t pass because the subway is under construction. Then if you talk to him again he says that the seemingly endless subway shutdowns aren’t really construction but are in fact part of an elaborate social experiment. For the purposes of the game, I don’t know if that’s actually true or if it necessarily has any effect on the main game story. But I do think fun and surprising interactions such as those will keep the player on their toes and make them excited to continue to explore the levels. Even if they just reach a dead end, maybe they’ll also uncover something funny. From the get-go, I’ve aimed to make the game entertaining through the art style and the animations. All of the art was done in Illustrator and then, when applicable, animated in After Effects. I think that makes for a clean, refreshing environment, in which the player can immerse themselves. Then, once the player has started to get into the game, I’ve tried to make the game’s dialogue interesting and even a little funny (and at times even bordering on self-aware). I think, as long as the player is having fun interacting with NPCs, I’ll be able to deliver plot points to them bit by bit, without them losing interest. Conflict and choice in the Game. I want the player to feel conflicted when they finally get the chance to rent an apartment. Speaking through the NPCs early on in the game, I will deliver the goal of renting an apartment – but it’s important that the directive doesn’t come from the game itself. I want to nudge the player towards renting the cheapest apartment or the best apartment for them. The player will have various hoops to jump through to achieve the goal but then, just as the goal is within reach, I will attempt to subtilty present them with an alternative. It won’t necessarily be of the greatest benefit to the player, but it will have the greatest benefit for the neighborhood and the community. At this point, what ideas are keeping your game alive for you? I still really like the idea behind the game and I enjoy working on it. I would like to see something come of it. I think it could use a more thorough dive into the full narrative of the game – it’s still not fully fleshed out. As it exists now, I think the game has an interesting concept but I think it would require a deeper dive to fully work out the minutia, in order to make it a more cohesive story. I think games like Undertale and Papers Please are a great source of inspiration when working on my game. I really like the idea that the player is able to make decisions that matter rather than just being there to click buttons that advance the narrative. It seems like the best way to get players to feel invested in the story and how it ends is by giving them some measure of control over how the story unfolds.